The Viewsonic PJD7830HDL projector produces great image and audio quality, but it's straddled with an over-abundance of legacy inputs. Wireless streaming is an optional extra. Succeeding the PJD7820HD model ($689, £448, AU$896)) in Viewsonic's home theater projector lineup, the Viewsonic PJD7830HDL ($1,050, £683, AU$1,366) is the new flagship digital light processing (DLP) projector. The PJD7830HDL features a brighter lamp, better audio output, more accurate colors and plenty of ports for connecting your entertainment than the model it replaces. Featuring a full HD 1080p resolution, the PJD7830HDL competes in the same home projector space as the Sony VPL-HW55ES ($3,999, £2591, AU$5079), which features 3D technology, and the Optoma GT1080 ($1,399, £870, AU$1,600). 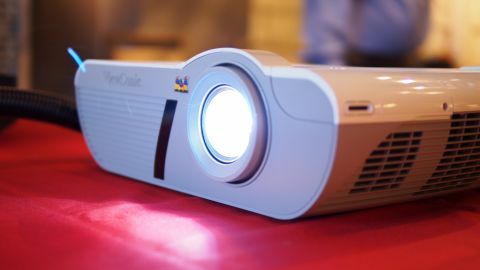 The PJD7830HDL also competes against small office projectors. Many of these devices – like the Epson EX7235 ($599, £385, AU$738) – come with a slightly lower HD resolution, but feature more modest price tags and smaller sizes. Viewsonic abandoned the angular black box of the PJD7820HD in favor of a curvier two-tone finish on the PJD7830HDL. This year's PJD7830HDL features a matte light grey bottom half, and a glossy white finish that coats the top half. The switch to a white hue on the top half, according to Viewsonic spokeswoman Joey Lee, is so that the projector can blend in better with the ceiling. When mounted to the ceiling, the glossy white top of the projector faces downward, and that's the part that is visible to you. No longer a rectangular box, the projector also features a curvier body with tapered edges and side grills that conceal vent openings for the fan. The design language is similar to Viewsonic's LightStream series. The 3,200-lumen lamp is located at the front, which features a raised curve that extends to the top of the unit. Documents sent to TechRadar after my meeting with Viewsonic states that the brightness is range is between 3,000 and 3,500 lumens. On the back of the projector are ports for connecting audio and video inputs as well as a single USB port. A cover for the rear helps to manage cable clutter and keep the ports hidden for a more seamless look in your living room or home theater. In a confusing situation, the projector that I saw during my meeting comes with a single HDMI/MHL port, but Viewsonic representatives later informed me that the retail model comes with a second HDMI port located on the front that can be used with an optional wireless dongle. The dongle allows users to stream content from a tablet or laptop on a Wi-Fi network without having to connect cables.